The shows will feature select SXSW breakout stars in addition to Monster Energy Outbreak Tour alums. With the commencement of SXSW 2015, Monster Energy and Idol Roc Entertainment are excited to announce that they will be launching the Monster Energy Outbreak House @ SXSW. The Monster Energy Outbreak House @ SXSW will serve as a microcosm of the acclaimed Monster Energy Outbreak Tour, bundled into a 4 day event. Each show will represent a specific Monster Energy Outbreak Tour genre, which will include a College, EDM, Hip - Hop, and Rock night respectively. 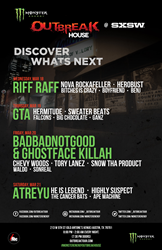 The shows will feature select SXSW breakout stars in addition to Monster Energy Outbreak Tour alums. The House @ SXSW will run from Wednesday March 18, 2015 to Saturday March 21st, 2015 at 213 W 5th ST. Austin, TX 78701. Doors open at 7:30 pm each night, with each show running from 8:00 pm to 2:00 am. "We’re excited to launch another extension of the Monster Energy Outbreak Brand and to be bringing this concept to the largest recording industry conference and festival on earth,” tour producer Steve Glazer said of the launch. “We are looking forward to seeing all of these artists at such an early stage in their careers, with the intention of discovering talent for future Monster Energy Outbreak Tours, all the while providing the artists the opportunity to showcase their talents to music industry influencers and thousands of members of the press." For more information on the Monster Energy Outbreak House @ SXSW and/or VIP tickets, please contact Casey Garner at casey(at)idolroc(dot)com (510) 333 - 7353.